Private Balcony W/ Water View, Lazy River and Lagoon Pool at Waterscape! 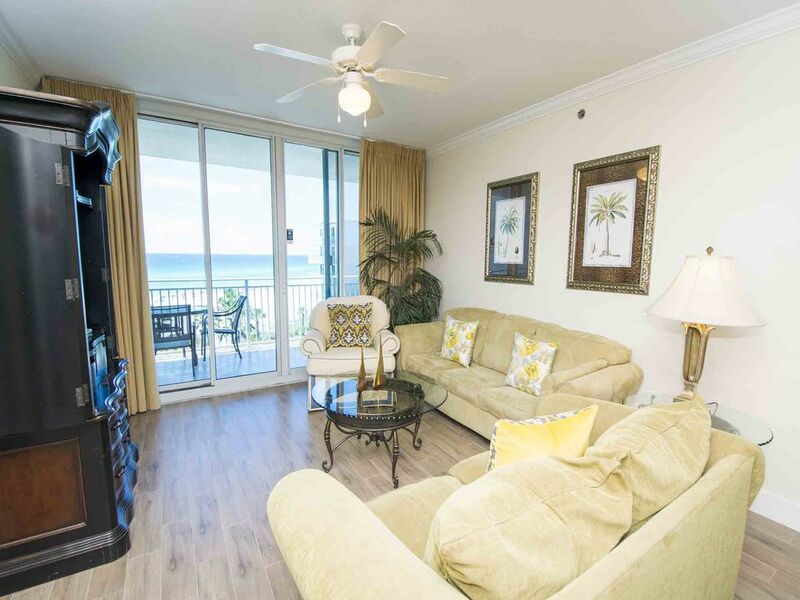 Enjoy a relaxing beach vacation and stay at Waterscape #504A on Okaloosa Island in Fort Walton Beach, Florida. This two bedroom, two and a half bathroom condo sleeps up to eight people and includes free wifi, fully-equipped kitchen, and private balcony. This is the perfect location for a family vacation. Relax on 490 feet of beachfront, float down the lazy river or lounge around the community pool. Additional amenities include a conference room, gazebo, fitness center, and more. Loved our stay. The room was perfect, the resort is super fun! So much to do! Will be back!! Arrived two days after last guests so there had been plenty time to clean - which they charge for - bed sheets were changed but no cleaning - it was dirty and had roaches. Needed app to reach rental managers but seriously no cell service from this unit. Number on wrist band wasn't the right number, maintenance man in building couldn't help. Writing this so the owners will know - cracked toilet seat (could cut you if used) and broken drawers - if not broken, they were dirty and still unusable. Clean and comfortable is a reasonable expectation at any rental price but especially in one that boasts beautiful decor and maintenance. Chose this place for the Lazy River and heated pools but they alternated closing them for days and cramming all in to the small heated pool - on Spring Break. Our extended family rented a small place in Destin and we went there our last day and had a wonderful time at that resort/pool. How sad our place was not as accommodating. Thank you for your feedback regarding your stay with us. We sincerely apologize that your stay was not up to standard. None of the housekeeping or maintenance issues were reported to us during your stay. We do have Guest Service staff available 24/7 to address guest concerns. Guest Services can be reached via phone, email, text, web chat, or through the Guest Portal. We would have been more than happy to send a housekeeper or a member of our maintenance team out to the condo to address any issues reported. Unfortunately, we do not manage the pool on site. Periodically complexes have to shut down the pools for maintenance, or to reevaluate the chemical levels. We apologize that this caused an inconvenience during your stay. We are glad to hear that you enjoyed the area and had family nearby as well. We hope you choose to visit the Emerald Coast again. We had a wonderful and relaxing time! Visited with family and friends. Will come back for sure! We're glad to hear you had a great time with your family and we look forward to your return. We really enjoyed our stay at Waterscape. The condo was better than I expected. The beds were very comfortable. My grandson especially enjoyed the bunk area. Everything about the condo was top notch. The unit was clean, comfortable, well-stocked kitchen, nice large balcony with a view of the pool area and the ocean. We enjoyed the dailly activities for the children. Will definitely stay here again.